March 10, 2017 | We Learn	| Story by Cathy E.
If a poufy hairdo, nail polish and little pink bows come to mind when you hear the word “Poodle,” you’re missing the point. While it’s true that some Poodle parents still favor the foppish look of leg and tail puffs, big hair and various adornments, most people who share their home with Poodles appreciate the breed for characteristics other than their foo-foo potential. 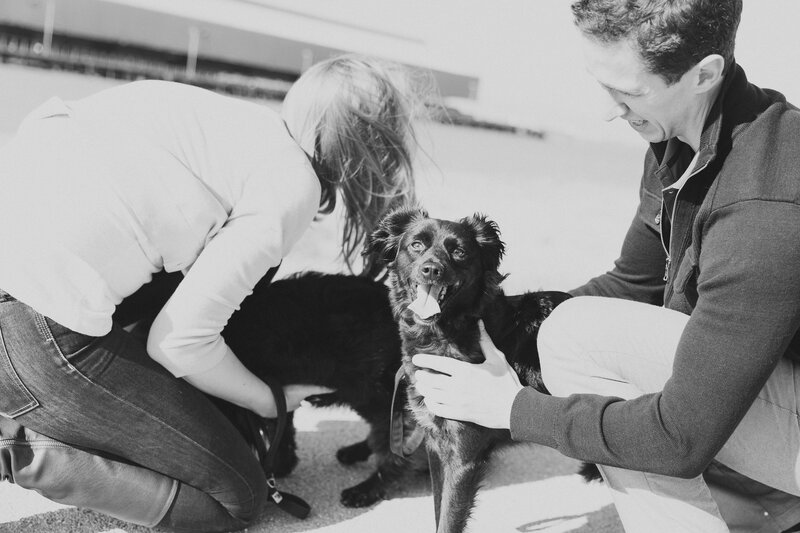 It’s hard to imagine my friend Kristi and her husband Dan with any other kind of dog. Kristi says Poodles tend to be very intelligent, and she likes the fact that they are both athletic and cuddly. For dogs that tend to be on the large side, her two standard Poodles are great house pets. For one thing, they have “soft hair that doesn’t shed.” Natural grace also helps them be right at home in the living room (although Winston, the apricot colored puppy, still has a ways to go in the grace department). According to the American Kennel Club, the categories “standard, miniature and toy” describe size only. Poodles are all one breed, derived from the original standard size. 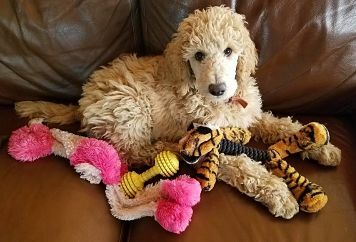 A website that conveys advice from veterinarians to pet owners—vetstreet.com—says Poodles have a well-developed sense of humor. Kristi’s dogs are no exception. Winston and big brother Toby enjoy being where the action is and can be counted on to clown around with the slightest encouragement. Poodles come in a variety of colors, and some are even two-toned. According to Wikipedia, both Germany and France claim to be the original home of the Poodle. Wherever they came from, the breed was first considered a working breed. The dogs accompanied hunters who found them easy to train. Poodles were used as retrievers, with agility and webbed feet that helped them bring game birds back from land and water. By the late 1700’s, Poodles had become popular companion animals in countries like England, France and Spain. They gradually came to be associated with upper class citizens who clipped, fluffed and dyed their coats. Today, Poodles are recognized far and wide as wonderful family dogs. They want to be with their people as much as possible—Kristi and Dan take their two nearly everywhere. In fact, if there’s anything Poodle parents have to watch, it’s that their dogs don’t become bored. The first time Kristi left Winston home for a short time, he gathered all his toys on the couch to keep him company! If you enjoyed this post, you should read “How To Eliminate Fleas” here.